Ypres (Ieper) in Belgium, near the French border, was the site of many battles during World War 1. It is the resting place of thousands of soldiers. At least four of my relatives are memorialised at Ypres. 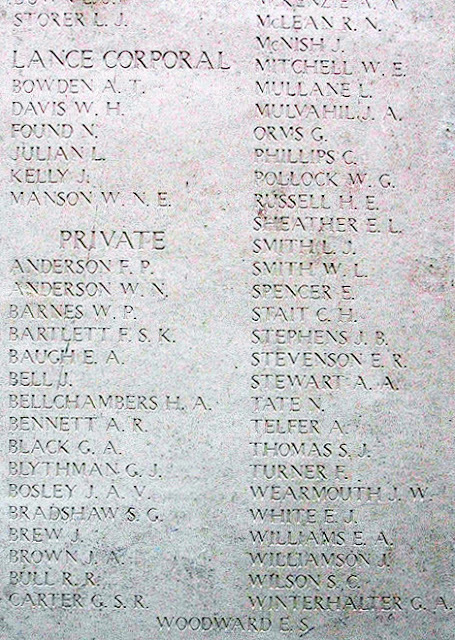 Melville John Pilgrim, Roy Richard Weir and Gilbert John Blythman are all listed on the same panel at the Ypres (Menin Gate) Memorial, which lists the names of those, whose graves are unknown or where there was no body remaining to bury. 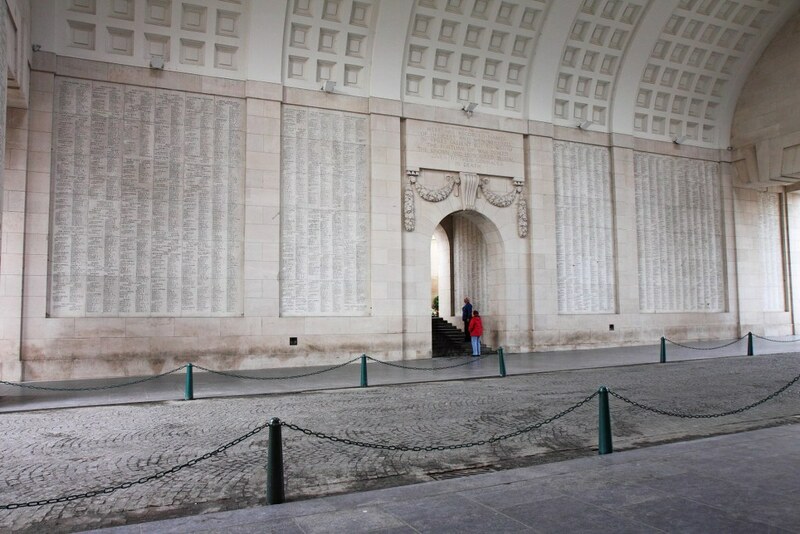 The memorial bears the names of over 54,000 men. According to the Commonwealth War Graves Commission website, the traffic is stopped at 8pm each night while members of the local fire brigade sound the Last Post in the roadway under the memorial's arches. One day I shall visit and pay respect to my relatives who lost their lives during World War I. 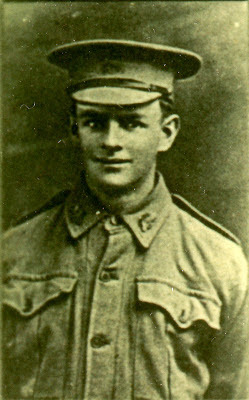 My first cousin, 3 x removed, Melville John Pilgrim was born the 6th October 1892 at Stone Hut, South Australia. He was a salesmen when he joined the Defence Force. 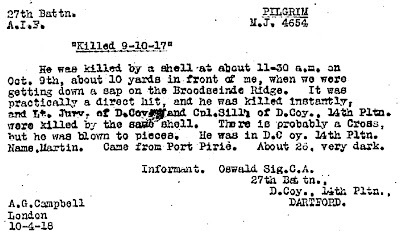 Melville had just turned 25 when he was killed (blown up) by a shell at Broodseinde Ridge, Belgium on the 9th October 1917. The Commonwealth War Graves Commission website provides more details about Melville and the memorial plaques at Ypres (Menin Gate) Memorial. The final resting place of my second cousin, 3 x removed, Ernest William Warner, is at Ypres, Menin Road South Military Cemetery . 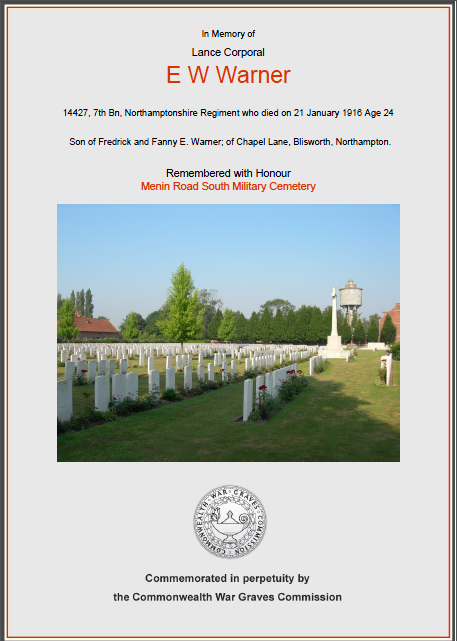 Ernest was born at Hanging Houghton, Northamptonshire on the 21st January 1892. Unfortunately he was killed in battle on the Western European Theatre (France & Flanders) on his 24th Birthday, 21st January 1916. The Commonwealth War Graves Commission allows you to create a memorial PDF, which summarises the details of the soldier. You will note on the certificate below, it also gives details of parents and an address. Roy Richard Weir is memorialised on the same plaque as his 2nd cousin, Melville John Pilgrim (mentioned above), at Ypres (Menin Gate) Memorial Belgium. Roy was born 21st August 1897 at Kinimakatka and grew up in the small farming community of Winiam. His birth certificate states his name as Richard Royal James Weir but all documents thereafter state Roy Richard Weir. 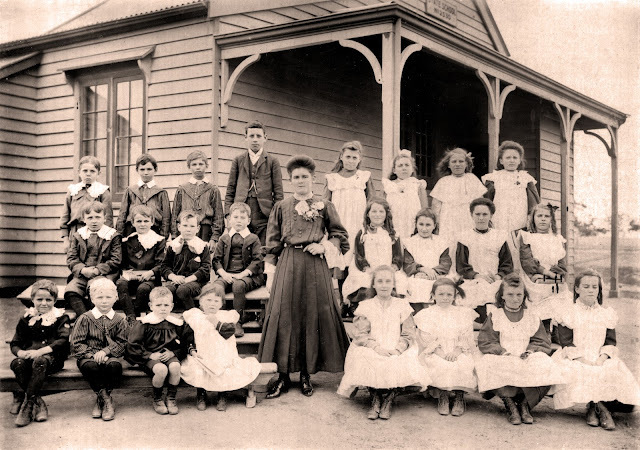 He attended the same primary school at Winiam as most of his cousins, including my grandmother. At least eight of the children in the picture below are relatives. Roy was employed as a plumber when he joined the Australian Imperial Forces at only 17 years old. His mother had signed a letter giving permission. He was killed by a shell at Polygon Wood, Belgium on the 25th September 1917. He had just turned 20. Gilbert John Blythman is also memorialised on the same plaque. He was a labourer from Nhill when he joined the Australian Infantry Forces. Gilbert was born 9th August 1888 and died at the Western Front in France on the 4th October 1917, age 29. He left a wife and two children at home. The AIF Project is another good source of obtaining information about ANZACs. You can read more about Gilbert on the website. when they were aged four and two respectively. What an interesting, detailed accounting. It's amazing how much information one can obtain, to discover everything from birth to death. Your pictures are perfect, supporting and the today photo, how rich the land is there now, with green grasses and striving trees. You certainly offered a fine tribute. Thanks! Thank you Karen. I hope it wasn't too long. I wanted to cover all four relatives but tried to keep it to photos and links rather than too much text. 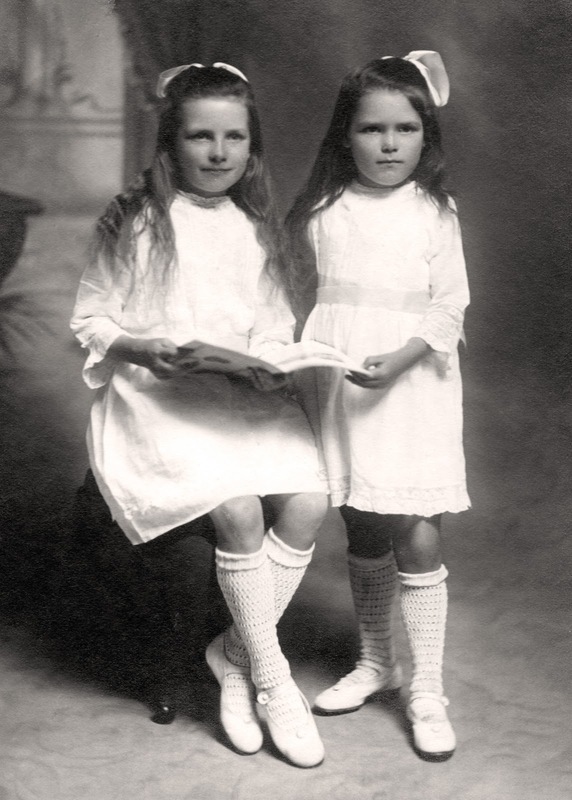 A wonderful tribute to your ancestors and I loved the photographs you showed. I could relate to your posting so well as my great uncle George Danson was killed on the Somme and researching his story was a moving experience. 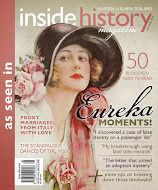 See http://scotsue-familyhistoryfun.blogspot.co.uk/2012/08/a-sad-watch-tale-sepia-saturday.html. 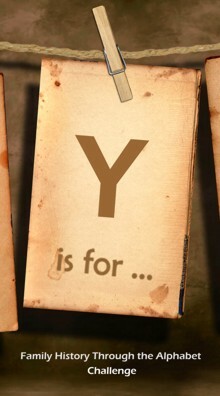 Thank you for choosing to feature Ypres under the Y of the A-Z Challenge - I must admit it never occurred to me when I was thinking of my contributions for the letter. Reading some of the accounts of how people died is very moving. "After two weeks of extreme battle at Pozieres France, Bob received a "Gun Shot Wound Severe" to his left arm on the 5th August 1916. This day was described by Major McSharry as "the heaviest barrage the battalion ever saw". Bob was lucky to survive as "Dead and wounded lay everywhere, some killed on their stretchers, with the stretcher-bearers lying dead beside them"
A great tribute to these brave young men Sharon. You have linked to a few web sites I will need to look at too. Thanks. The tales of war are always so moving and sad. I'm pleased we are able to honour these brave souls and share their stories. I agree Fi. Especially as many of them don't have family to remember them. Ypres was indeed a truly horrific battleground. My paternal Grandfather fought there, with the Canadian Expeditionary Force, and fortunately he survived. You've written a truly beautiful tribute to your Ancestors who "paid the ultimate price" Sharon. Thankyou for sharing. Best of wishes,Catherine. Thank you Catherine. Did your grandfather tell any of the stories about his time during the war? Most didn't seem to talk about it. 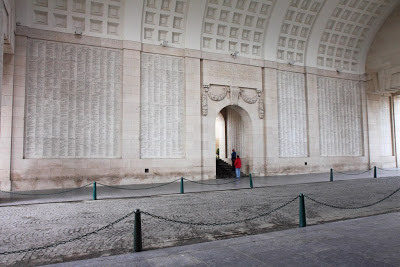 I just read your Ypres post, Sharon, and found it very moving. Now that we are in Veterans' Week here in Canada (Nov. 5-11), it's even more poignant. 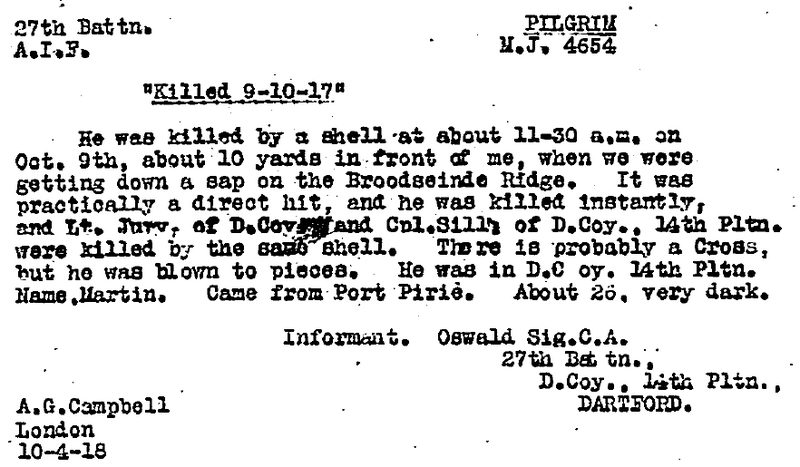 I was surprised to see that little card (witness statement) about your cousin Melville Pilgrim. I didn't realize that this kind of resource was available online. I don't believe we have something like it in Canada. Thanks Yvonne. I did think of waiting until 11am on the 11th November to post this. We are very lucky in Australia as the war records have been very well maintained and are easily accessible online. A beautiful post and tribute to your ancestors. Poor Carrie Blythman (nee Warner) lost her husband, brother and several cousins. It is so hard to imagine and comprehend how families must have felt, especially those who lost multiple family members. Whilst researching "Valiant Victims", I came across an unrelated family who lost three sons. How devastating. This was a very simple but moving tribute. The eye witness card and the picture of the little daughters who lost their father, very sad.